Through neglect of the advice of geological experts, this dam was built on unstable ground that failed when the dam was filled with water. Discussions about a dam on the Teton River began in the early years of the twentieth century. It would provide additional water resources, flood control, and electrical power. Discussions intensified in the 1930s and again in the 1960s. Then in 1964 the U.S. Congress gave approval for a dam, but construction was delayed for a decade by objections from environmentalists and geologists. By October 3, 1975, construction of the dam was completed and filling began. 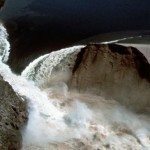 Eight months later it collapsed and eighty billion gallons of water burst out, devastating everything before it. Eleven lives were lost, 180 square miles flooded, and damages of $400 million incurred. The project would provide additional water resources to 111,210 acres of land in the Fremont–Madison Irrigation District, local and downstream flood control benefits, water to operate a 16,000 kilowatt power plant, and major recreation developments. Groundwater pumping in dry years would supplement the water supply when surface flows were inadequate. Design called for a 130-foot-high earth-fill structure with a crest length of 3,100 feet including spillway, and a crest elevation of 5,332 feet. The total capacity of the reservoir created by the dam would be 200,000 acre-feet. For about ten years objections from various groups delayed the start of construction. Environmentalists argued that the dam would destroy seventeen miles of the Teton River, a popular haunt of trout fishermen, and remove 2,700 acres of deer and elk habitats. The response to these concerns by the Bureau of Reclamation, the U.S. government agency responsible for the project, was that the benefits from flood control and irrigation would more than compensate for these losses. The objections from geologists were quite different. They insisted that the rock on one side of the proposed dam was weaker than on the other and that a dam on such a site was a formula for disaster. Later events proved them right. It seems that even as recently as the 1970s, the critical roles of geologists and geology were still seriously underestimated. These neglects were the main causes of the failures of St. Francis Dam in California in 1928 and Vaiont in Italy in 1963. From these tragedies came strong recommendations that geological expertise needs to be given the highest priority in all designs of dams, especially in places where the rock is extensively faulted and where there is a history of earthquakes. The Teton Dam site was a location where both of these conditions were found. The consistent claim of geologists was that one side of the dam was weaker and, therefore, when compacted by the weight of water it would rupture. This in turn would create a leak, progressively eroding the earth structure. Those responsible for the construction of the dam minimized this risk. A U.S. Geological Survey (USGS) team sent a memo to the Bureau of Reclamation in January of 1973, after construction of the dam had begun, expressing immediate concern for the safety of the project. One member of that team, Harold J. Prostka, returned to the site after the tragedy and pointed out that the site of the dam was in a geologically young and unstable area. He then identified numerous fractures and faults at the site. Other geologists added their comments in the aftermath of the dam failure. Dr. Robert Curry, a professor of geology at the University of Montana, testified that poor site selection and an inadequate approach to design and construction led to failure. He noted that the Bureau of Reclamation’s regional study in 1961 dealt with site hazards in a broad manner, barely mentioning permeability. Curry was quite sure that the data on which Congress authorized the Teton Basin Project was inadequate. Dr. Marshall Corbett, a geologist from Idaho State University, agreed with Curry that the site selection for Teton Dam was wrong. He pointed out that good site selection was important, but the good dam sites had long been used up. Steven S. Oriel, another USGS geologist, voiced concern about the inadequacy of scientific information about the site of the dam. In a final report to the Department of Interior these fears of geologists were confirmed. The report concluded that the design of the dam failed to take adequate account of the foundation conditions and the characteristics of the soil. Following the years of delay, work on the dam was speeded up in the 1970s. This included speeding up the rate of filling from one foot per day to two. The reservoir was completely filled during the months of October and November of 1975. Generator installation followed a month later and then the spillway three months after that. On June 1, 1976, Teton Reservoir contained ten million cubic yards of water with surface dimensions of 3,100 feet by 1,700. The dam, an earth structure, stood 130 feet high. Barely had the work of construction been completed before questions of stability surfaced. Early on the morning of the June 5, 1976, the first signs of trouble appeared. A hole was seen to be leaking water near the right abutment at 7:30 A.M. and the flow of water was increasing but no one felt the problem was serious. This sort of thing was seen as normal in a new dam. A second leak appeared at 10:00 A.M. and one hour later a whirlpool formed inside the reservoir. A couple of bulldozers were brought in and loads of loose rocks were pressed into the area of the leak. It soon became clear that there was a huge eroded area beneath the leak. Both bulldozers sank down into it and the drivers were just able to escape in time. By the middle of the day no one was in any doubt about the danger. Warning messages were sent out to all places downstream. Three minutes before noon the dam collapsed and a high wall of eighty billion gallons of water swept down the canyon of the Teton River, taking power and telephone lines, power station and pumping plant, and everything else in its path. Millions of cubic yards of mud and rocks were taken away in the flood and these added greatly to the power of the water when the flow encountered any obstruction. Residents downstream acted as quickly as they could and were able to evacuate the towns of Sugar City, Teton, and Newdale in half an hour. The water rushed through the can- yon, largely bypassing Teton, St. Anthony, and Newdale because they were on high ground. Outside of the canyon the water spread to a width of about eight miles and sped along at ten to fifteen miles per hour. The rushing water hit the town of Wilford and obliterated it, literally wiping it from the map. Sugar City, between the two forks of the Teton River, received the full force of a fifteen-foot-high wall of water crashing down on it. Rexburg was the largest city in the immediate flood area, most of it on the valley floor. The debris-laden water swept past a log mill on the outskirts of town, adding large logs to the flotsam. The logs acted as battering rams, and along with the rushing water, severely damaged buildings throughout the city. In the evening of June 5, officials of the Mormon church that owned Ricks College, unaffected because of its location on higher ground, offered to help. It supplied food and housing to anyone affected by the flood and Ricks College became a temporary home for many flood victims. On June 6, President Ford declared Bingham, Bonneville, Fremont, Madison, and Jefferson counties federal disaster areas. The water rushing out of Teton Reservoir threatened the venerable American Falls Dam that lay downstream on the Snake River. In an effort to save it, the outlets were opened to full bore in the hope of emptying it in time. It had to release more water that it ever had to do in the past in order to receive more water than ever before. Concern focused not only on the American Falls Dam, which was an old structure, but also on the smaller dams farther downstream. Water reached the dam on June 7, and fortunately it was able to absorb the full volume of the Teton Dam’s flow. When the waters receded, the extent of damage began to be assessed. Eleven deaths were attributed to the dam failure and subsequent flood. Final estimates were approximately one billion dollars. After the flood, repair of damages became the first priority. The Federal Emergency Management Administration (FEMA) was one of the first on the scene. By August 6 all the emergency repairs were completed and the remaining tasks handed over to standing local authorities. On the twenty-fifth anniversary of the failure of Teton Dam, the Regional Director of the U.S. Bureau of Reclamation spoke of the things that happened in the intervening years. Teton became a new point of departure in the work of the Bureau, profoundly changing all aspects of its work. The Reclamation Safety of Dams Act of 1978 was a beginning, providing funds to analyze and modify structures likely to be unsafe. Thirteen dams in the Pacific Northwest have already been modified under this program. Beyond the 1978 Act, there were many other changes introduced as lessons were painfully learned from the mistakes at Teton. Since 1976, independent peer reviews are required for all studies of dams and for all designs and design changes. Redundant measures to control seepage and piping (tunnel erosion of soil), special treatment of fractured rock foundations, and frequent site visits by design engineers during construction have become essential parts of the planning and construction of dams anywhere in the nation. Furthermore, dams must be inspected annually and in detail every three years. Every six years dam performance must be assessed under different load conditions, that is with varying volumes of water in the reservoir. The results are measured with new instruments that have already been installed at dams, replacing the uncertainty of visual inspections. The devastation that followed the failure of Teton Dam is a part of the U.S. Bureau of Reclamation’s institutional history but the lessons learned from it are now being lived out all over the country. When the area around Tacoma, Washington, was hit with a 6.8 earthquake on February 28, 2001, it immediately triggered on-site visual inspections of thirty-two reclamation sites, all within a radius of 316 miles from the earthquake’s epicenter. There were no reports of damage to dams and no hydroelectric power operations were affected. Further inspections will be carried out on these dams in the springs of the succeeding two or three years, as they experience differential volumes of water, to ensure that the earthquake did not weaken them.